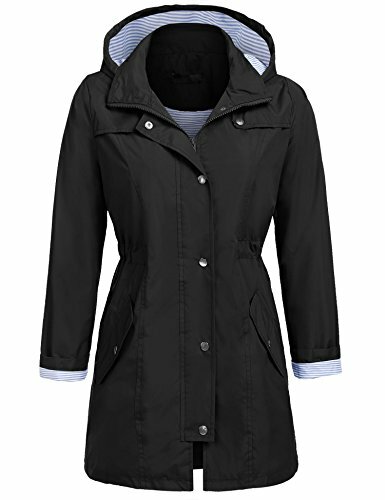 The Raincoat has 2 side pockets are a good size to hold all kinds of things, it covers the hips, and the hood is generous but doesn't overdo it. The Rain Jacket is sturdy but lightweight. Suit for Climbing, Cycling, Camping, Hiking, Running, Traveling ,Fishing and Other Outdoor Sport. Garment Care: Washing max 40?, Drip flat drying in the shade. US Size S---Shoulder:40.8cm/16.1"---Sleeve:59cm/23.23"---Bust:105cm/41.34"---Waist:101cm/39.76"---Center Back Length:77cm/30.3"
US Size M---Shoulder:42cm/16.54"---Sleeve:60cm/23.62"---Bust:110cm/43.31"---Waist:106cm/41.73"---Center Back Length:78cm/30.7"
US Size L---Shoulder:43.8cm/17.24"---Sleeve:61cm/24.02"---Bust:117.6cm/46.3"---Waist:113.6cm/44.7"---Center Back Length:79cm/31.1"
US Size XL---Shoulder:45.6cm/17.95"---Sleeve:62cm/24.41"---Bust:125.2cm/49.29"---Waist:121.2cm/47.72"---Center Back Length:80cm/31.5"
US Size XXL---Shoulder:47.4cm/18.66"---Sleeve:63cm/24.81"---Bust:132.8cm/52.28"---Waist:128.8cm/50.71"---Center Back Length:81cm/31.9"